This has just started happening in the last few weeks, and I can't work out how to change it. It used to be that I could use Cmd+= to zoom in in my web browser, and cmd+- to zoom out. But just recently, that has been overridden so that it opens Widgets settings. It's also odd because there are all these (x) buttons to close widgets (presumably) but there is nothing there apart from the buttons. Anyone know how to change that shortcut so I can zoom in my browser again? 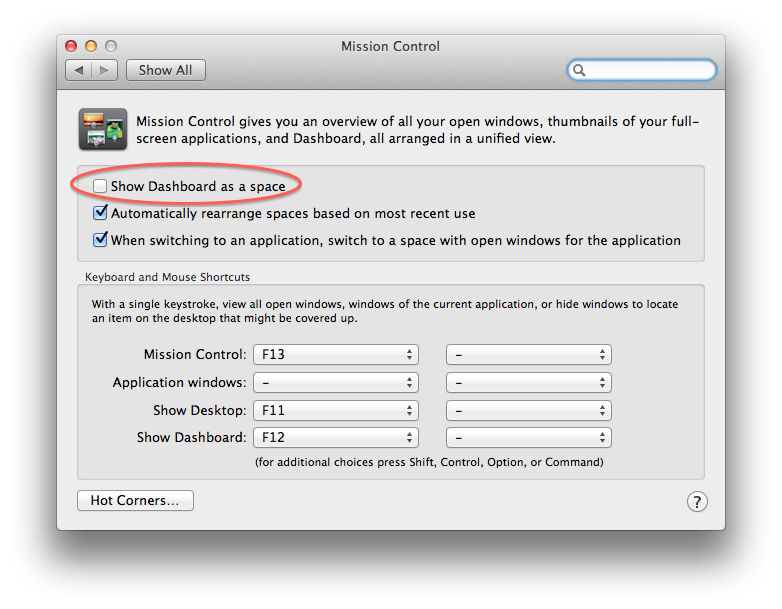 I was able to fix it by unchecking "Show Dashboard as a space" in Mission Control Preferences. No idea when exactly this change happened or why this fixes it though. I would have preferred to be able to just re-map the shortcut, but I can't find it anywhere. Not the answer you're looking for? Browse other questions tagged keyboard google-chrome dashboard-widget zoom . How to zoom with cmd+mouse wheel in Chrome? How can I reprogram OSX to use Windows-style shortcuts for all operations?